Pre-Order “The Miraculous” Some seriously heavy vibes from Anna and her organ – pitched somewhere between drone and indie-noise-rock. Sounds intense, which it is, but also amazing. In the year I fell back in love with Spacemen 3, this was the perfect accompaniment. The cover of Anna von Hausswolff’s forthcoming album The Miraculous features stunning black-and-white photography courtesy of the fantastic Anders Nydam, who ended up working outside of his comfort zone to create the visuals. With a love of Scandinavian Black/Death metal albums, and why he’d join Anna’s army in the event of an interstellar dogfight. 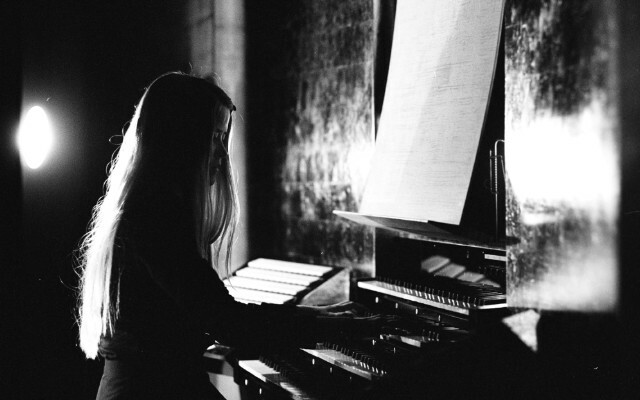 Swedish organist Anna Von Hausswolff released the gorgeously austere Ceremony a couple years back, and she’s prepping a new LP titled The Miraculous, which was recorded on a colossal pipe organ in Northern Sweden. Her forthcoming album’s first takeaway “Come Wander With Me/Deliverance” is a sprawling, 11 minute behemoth that sweeps between gothic ambience and dramatic, heavy metal. “An oath,” her latest single, is a fiery and vociferous 3-minute song that wastes no time to cast you into its flames. Beginning with a simple organ melody, it quickly takes off into a siren of brazen celebration. It’s a confident and carousing song, as if its marking an epic, historical event or leading an army into a storm. Hear the awe-inspiring track below. The Miraculous is out on November 13th; Anna von Hausswolff plays London’s Oslo on December 8th. Check out the video for Ny – which was directed by Anna’s sister Maria and shot by Anders Nydam.